Hello and welcome to our live coverage of the final stage of the Volta a Catalunya. Today's stage runs 143km from Barcelona to Barcelona, ending in Montjuïc Park. The riders are just getting the final stage underway now. They'll head out of the city, taking in a first category climb, before racing back to Barcelona for eight laps of the now-traditional Montjuïc Park circuit. A 12-man group has gone on the attack early on. We'll get you the names of the riders as soon as possible. Of course, the race lead of Miguel Ángel López could come under threat today. Adam Yates and Egan Bernal lie 14 and 17 seconds down respectively. Last year on the same stage Simon Yates took the stage win by 13 seconds ahead of Marc Soler, so getting a race-winning gap is certainly possible on this finishing circuit. In the neutralized zone and Dries De Bondt has taken a tumble. Another tumble and this time it's a rider from Mitchelton Scott who hits the deck. There was a major fall in the women's race too during the neutralized zone. That time the race had to be stopped. What's going on? "There's going to be a long battle from the start and that will decide who can be the winner but the last part comes at the end of a long day," Viviani told us at the start. "There's a headwind in the last 30km and that's an advantage for me. I think the best option is for it be like last year, but then I missed out in the sprint with a mistake. I hope for the same again, but without the mistake. We have a super team, last year I had four guys with me and they're 100 per cent focused for my sprint. We're hear to continue the winning run. Everyone from our team can win. Four or five of us can be the leader." The break are two minutes up on the peloton at the moment. Juul-Jensen, by the way, was the faller from Mitchelton-Scott but the Dane has quickly made it back to the rear of the peloton, and just in time as we're now officially racing. The break are heading towards the first climb of the day, the first category Coll de la Creu d'Ordal. It's 5.5km long at an average of 4.4%. Andreas Schillinger (Bora-Hansgrohe) has abandoned the race. The break is not 3:50 up on the peloton. It's a pretty strong breakaway today with some good climbers like Verona and Formolo. Of course, former race leader De Gendt is there to seal his mountain classification victory – after this initial climb there's a third category climb on each of the eight closing laps, so plenty of points up for grabs. De Gendt leads the break over the Coll de la Creu de l'Ordal. Verona and Knox take second and third. They're two minutes up on the peloton as they begin the descent. There's just over 40km until the first intermediate sprint of the day at Castelldefels. The riders will reach the finishing circuit in around 70km. Over in Belgium, Gent-Wevelgem is underway. You can follow along live here. 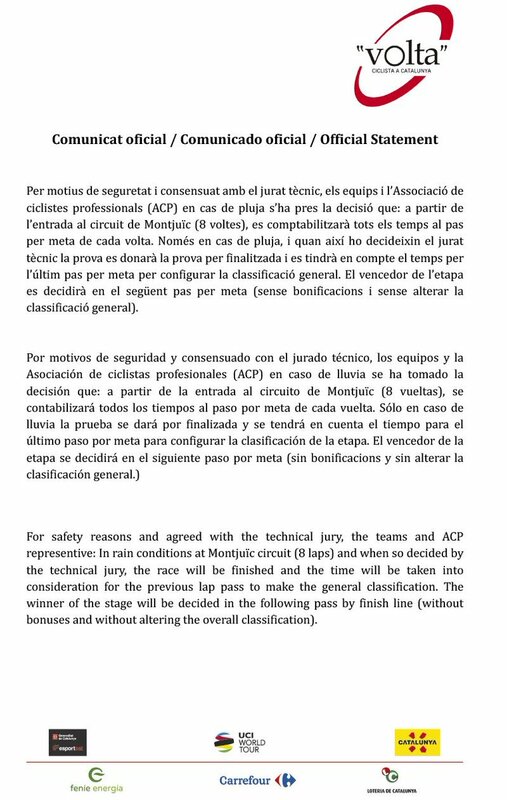 The race organisation have released a safety statement regarding the finishing circuit. In the case of rain in Barcelona, the race jury will decide on which lap GC times will be taken, with the race finish coming at the end of the following lap. Rain was forecast for today's stage, but looking at the latest updates it looks like there's only a small chance of rain this afternoon. Stage 5 winner Max Schachmann before the stage: "We have a strong team for today's stage and we will try to play our cards." His team Bora-Hansgrohe have Davide Formolo in the break, so that's one strong card played already. Yesterday's stage saw Team Sunweb's Michael Matthews take his second victory of the race, beating Phil Bauhaus (Bahrain-Merida) in a photo finish. Read our full stage 6 report here. Formolo is the best-placed man on GC from the break today. He's 30th, 11:48 down on race leader López however, so there won't be any threat to the podium here. Bevin leads Formolo and Barceló over the sprint in Castelldefels. Still a two-minute advantage for the break as they near Barcelona. They're currently around 10km from the start of the circuit. Mitchelton-Scott and Team Sky lead the peloton. The break are 2:15 up on the peloton now. Not long until the they reach the circuit. The peloton is really strung ou on this highway. A fast pace being set. And the break reach the finishing circuit. Eight third category climbs on the way. De Gendt leads the mountain classification on 51 points, while Verona is on 35 points. It's possible that the Spaniard could overhaul him, but very unlikely. The Alt de Montjuïc is 3.3km long with an average gradient of 5.2% and a maximum of 8%. It's sunny in Barcelona – doesn't look like there's much chance of rain today. Froome leads the peloton 1:45 down on the break. De Gendt took the points over the first ascent of the Alt de Montjuïc. Just 1:20 for the break now. Riabushenko, Gougeard and van der Lijke have been dropped. Meanwhile Froome has dropped back from the peloton after his work. Team Sky leader Egan Bernal lies 17 seconds down on race leader Miguel Ángel López, and has a real, if slim, chance of overhauling his compatriot today. Last year the 22-year-old crashed out of second overall on this stage. Here's hoping we don't see any repeats of that on the circuit today. The dropped riders made it back up to the break. Still, not an ideal sign for them this early on. Sky and Mitchelton-Scott are still driving the peloton. And there's a crash on the downhill, on the outside of a corner. Around 15-20 men are down. Romain Bardet, Simon Geschke, Marc Soler, Eros Capecchi, Merhawi Kudus are among the riders to hit the deck. Bardet looks in some trouble and his race looks over. Geschke is still on the floor too. Meanwhile Davide Formolo has attacked the break. Daryl Impey (Mitchelton-Scott) tries a move but it's quickly shut down. Several other riders are still sat on the ground at the crash site. An Arkéa-Samsic rider, possibly Warren Barguil, was getting carried away. Bernal, Quintana and Simon Yates have gone on the attack. Formolo has a decent gap on the break now. It looks like Andrey Zeits and Tanel Kangert are in the attack group too. It's actually Ivan Sosa and Michael Woods, not Bernal and Kangert. Formolo is still out front on his own. 1:25 back to the group attacking the peloton. Verona has dropped back to the Quintana attack group now. Verona is driving the group along for Quintana, of course. Romain Bardet leaves the race, getting into his team car. It looks like a collarbone injury. CCC Team have tweeted that Simon Geschke will be taken to hospital for X-rays. The Quintana group is still hanging out there. They're not too far ahead of the peloton though, maybe ten seconds. Four laps of the circuit done, four to go. 1:30 between Formolo and the Quintana group. Another ten seconds back to the peloton. We don't have a time check to the remains of the break. Formolo is still putting up a great fight here. The Quintana group has been caught now. Quintana is having another go! Formolo is the solo leader now, as the remainder of the break is reabsorbed. The Yates brothers have gone on the attack! A rare sight indeed. Simon and Adam Yates catch a few of the riders from the break who were still out there. 20km to go now as the peloton pass across the line once again. Adam Yates is the virtual leader on the road right now. Zeits leads the peloton for Astana. López only has two men left on the front of the peloton. 1:07 between Formolo and the Yates group. 1:30 back to the peloton. Simon Yates is struggling to keep up now, with Adam pushing the pace. Adam Yates and James Knox are clear. Knox takes some turns on the descent. Yates is in the virtual lead by 17 seconds right now. Simon is back with Adam and Knox now. Formolo is still a minute up the road. Just under a minute later the Yates group passes the line. Half a minute further back comes the peloton. López leads the peloton ahead of Bernal. Simon Yates has done his job. Adam and Knox are off. Adam Yates goes it alone now. Knox is dropped. He's 45 seconds down on Formolo and 45 up on the peloton! 30 seconds is the virtual lead for Yates now. López attacks! His attack has blown apart what remained of the peloton. An elite group up there now, but nobody wants to work with him. 35 seconds between Yates and Formolo. 1:11 back from Formolo to the peloton. Formolo 40 seconds up on Yates as he passes the line onto the final lap. The peloton are a minute down. Yates is still alone with the peloton charging behind. It's going to be tight here. Formolo is 55 seconds up on Yates. Sivakov leads the peloton for Sky. The peloton are just 20 seconds down on Yates now. Not many riders in the peloton now, maybe around 15. It's an elite selection chasing Yates. Valverde goes on the attack. López is riding to victory here. Valverde and Sky are pretty much pulling him along now. Formolo should have this in the bag now. It's over for Yates, meanwhile. Bernal catches him. The group is back together now, 45 seconds down on Formolo. Formolo takes the win! Mas is solo behind. Mas took second. Lopez secures the overall victory! Max Schachmann nipped out of the peloton in the closing metres to take third place. 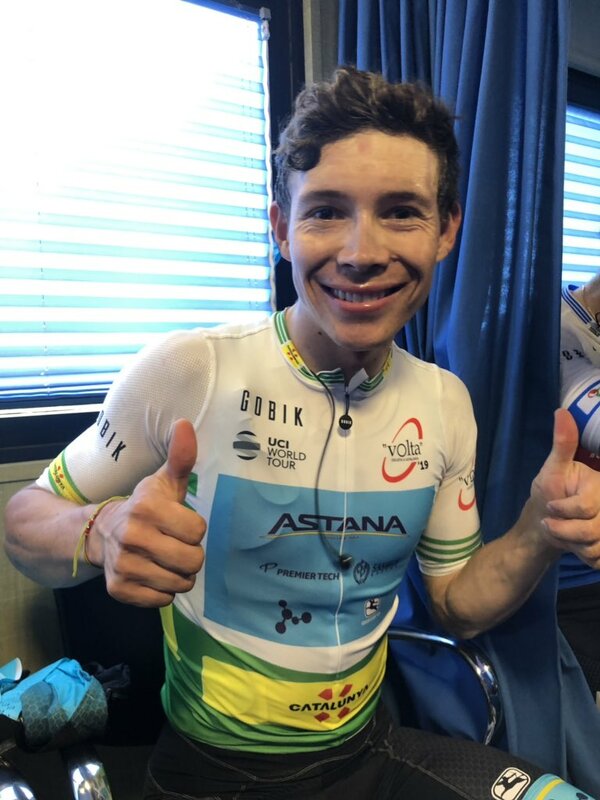 A great ride from Formolo, and a fantastic way to take his first victory since the 2015 Giro d'Italia. Back in Spezia in 2015, Formolo attacked the early break 13km from the line for his first career win. Only the spectacular for the Italian. Here's a shot Formolo celebrating as he crossed the line, via Getty Images. No change on the GC podium as López takes it from Yates and Bernal. Movistar are on the podium as the team classification winners. Not much of a surprise there. Michael Matthews secures the points jersey. Max Schachmann's third place today saw him fall just one point short. Thomas De Gendt, of course, is the king of the mountains. Meanwhile, it's all kicking off at Gent-Wevelgem as they head into the final 100km. Follow the action live here. Our short stage report is up now. Stay tuned for the full report, photos and results, as well as further reporting from our man in Catalunya, Alasdair Fotheringham. Anyway, that's the end of our live coverage of the Volta a Catalunya. Keep coming back for more live reports through the Spring Classics!